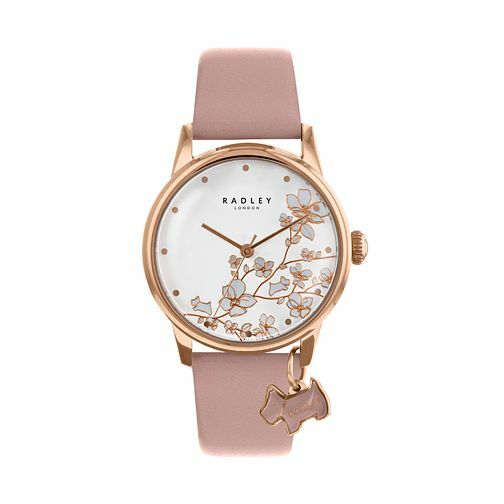 Add a sophisticated flair to your look with this Radley Ladies' Pink Dial Pink Leather Strap Watch. The intricate floral pattern against the sleek white dial gives this watch refined feminine charm, the dial is beautifully complemented by the rose gold tone hands and indices giving it a beautiful modern finish. The design is completed with the sleek bracelet. Radley Ladies' Pink Dial Pink Leather Strap Watch is rated 5.0 out of 5 by 1. Rated 5 out of 5 by Anonymous from Lovely watch, love the colour. This is a very pretty watch, lovely pink leather strap. Face is a cute design with two little Ridley dogs and another dog attached to the band. Love it. Great service from H.Samuel, good communication, arrived very quickly.